Use this exciting sports event as the starting point for a range of educational activities! Our Winter Olympics Mini Pack includes a Powerpoint topic guide, writing prompts, event posters, Maths challenge activities and more! One 10 Page Winter Olympics Guide – A full guide to the Winter Olympics, based on the 2018 Games in PyeongChang in South Korea. Includes information about the events, PyeongChang and more! Fifteen Winter Olympics Events Posters – Posters that can be used to teach your children about the events that athletes take part in during the Winter Olympics. Fifteen Writing Prompts – High quality images with an accompanying prompt to give your children an exciting start point for their writing. These cover narrative writing, instructions, persuasive writing, letters, diaries and more. Five Sets of Winter Olympics Problems – Sets of questions based on the results of events from the Winter Olympics at Sochi in 2014. The sets vary in difficulty and answers are included for teachers / self-checking. Forty Winter Olympics Maths Challenges – A set of Maths challenges based on data from Winter Olympics events over the years. Includes an answer sheet for children to record their answers on and a full set of answers for teachers. Five Winter Olympics Drawing Activities – A set of drawing challenges for your children to try. Can they design some new Winter Olympics medals, a new mascot for the next Games or an Olympic torch? Also includes a South Korean flag to colour and a map of the country to label. One Winter Olympics Wordsearch – Can your children find the names of the Winter Olympic events on this wordsearch? One Winter Olympics Banner – An eye-catching banner to use as part of your ‘Winter Olympics’ displays! 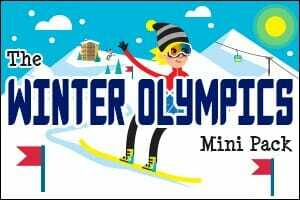 Watch the video below to view samples of resources from the Winter Olympics Mini Pack. This was also a fun topic to explore with some EAL students, especially in 2018 with the Winter Olympics in South Korea. It helped them put Asia on the map and learn more about that part of the world. As we live in a country with many winter sports, we had fun learning about them in English. They loved the graphics and were excited to learn. Thank you so much for the time and effort you and your team have put into this Olympic Mini Pack. As per usual, this resource is of very high standard and will help me put together an engaging unit of work for my class. This pack is very timely. It is always good to be able to include current happenings into our teaching. This makes it more real for our students. Thank you for this pack. It makes it so easy to incorporate current events into the school day.